Our client list contains many and varied businesses that have been gained and kept by our company through good service and quality workmanship. As well as a number of private customers. "We are very happy with the service provided to us by Mark and recommend him and his business." 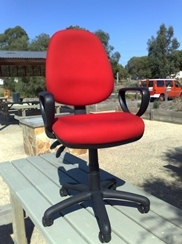 "We wish him all the best in his endeavours"
"You get the work done quickly with a very good result - thank you"
"Mark's service and quality of work have never let us down"
"We higly recommend chairfix to people quite often"
"Awesome work Mark, thanks again for fixing the chairs so quickly." "We really appreciate this and our customer is most happy"
Bill Cavanagh, Bonanza Truck Sales. "Thats great, thanks for that, we've sold that truck and the guys coming to pick it up tomorrow"
"We were very happy with the job that Mark did for us"
"You do good work Mark"
"The Pink Ladies are very impressed with the work you did for their cafeteria, Thanks"
"Looks brilliant, well done !!" "Thanks very much, much appreciated."